Digital Green is an interesting ongoing knowledge exchange project in India. With the objective of improving the food and nutrition security of small and marginal farmers Digital Green produces videos by farmers, of farmers, and for farmers. Videos showing sustainable agricultural practices and technologies with both short-term and long-term rewards that increase motivation. Surveys found that farmers learn about innovation most effectively through sharing with community members who face the same constraints, and are often less inclined to adopt innovations when an external actor was demonstrating the improved practice or technology. Therefore Digital green decided in 2006, starting in India, to go to the villages of small farmers and make videos about agricultural practices of farmers to be viewed by other farmers in their community and other villages. During each screening, the village-level entrepreneurs use paper forms to record this information, the community's attendance and feedback is recorded, as well as the practices that farmers apply on their own farms. These forms are then digitized on district-level computers using Digital Green's online/offline, web-based data management framework. This data is then visualized on Digital Green's analytics dashboards, "Farmerbook", and videos library to target the production and distribution of videos based on the community's interests and needs. Food Security Open Data Challenge's "Hack4Hunger"
Last September, Digital Green participated in USAID’s first “Hacking for Hunger” hackathon, one of the core components of USAID's pilot program the "Food Security Open Data Challenge". The Food Security Open Data Challenge falls under the Open Data Initiative of USAID’s Office of Innovation and Development Alliances (IDEA). Its objective is to bring together food security experts to outline the key pain points in food security and work with technologists to identify where interventions might be possible and useful. Entrepreneurs and innovators then use data to develop effective and scalable products to create solutions to food security problems. 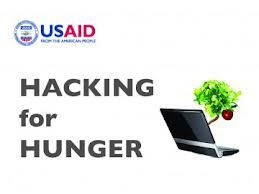 The Objective of the Hackathon "Hack4Hunger" was to exhibit innovative uses of open data, technology and mapping. Take a look at the #Hack4Hunger Presentation: Digital Green & Palantir video in which the project is explained and illustrated.